I've played bass for Shania Twain, had a black rhino charge me while on safari, and I've been in the Oval Office. In high school, I went backstage to interview groups like Bob Seger, Rush and Kansas, sorta like "Almost Famous" but without Kate Hudson! As an author, I draw from all these experiences (and then some) when crafting my stories. The quote that sums me up the best is by G.K. Chesterton: "Nay, the really sane man know that he has a touch of the madman." I'm married, the father of four wonderful children, and a proud grandfather. I currently live near Nashville, TN where I write, bike and am always on the prowl for adventure and stories. Countless times I have heard, “I would never go through rush again,” yet here I am, going through it a second time. I like to think since I have gone through this before, I am so much wiser than the people going through if for their first time. However, I’m still getting caught up in the thought that this is everything. Which it isn’t, it is just a very emotional process where you make yourself vulnerable. The thoughts of not getting invited back to my top houses ,or at least one, has me in an anxious mess. It was not until last night I had finally processed I’m doing this whole thing again. Last year, I was so confident. I was senior class president,had good grades, and anything else I thought a sorority could want. In retrospect, I can see how I was searching for my identity and security by joining a sorority. In my last post, I told you that I visualize my characters before I flesh them out on the page. So I pretend I’m the casting director for the movie about my book. I’d been hunting for Newcomb: storyteller, man in his fifties, wise, confident, white hair, medium build. I had just about conceded defeat until an elderly gentleman several rows in front of me caught my attention. The lighting made his white hair glow. I perked up and watched his every move, noted how the light caught every strand of hair, imagined him in the tunic he’d be wearing in my story… I don’t remember the sermon but I’ll never forget discovering Newcomb. I love this mug’s saying, not only because it’s funny but because it’s true! Channeling one’s anger (or any emotional experience) into a character is a GREAT way to add depth. I purposefully made DeMorley (a conniving minstrel lacking musical talent) my Nashville music biz punching bag. I poured my negative experiences-the filth, the lies, the BS-into DeMorley. Not only was this refreshing and fun to do, but it saved me from paying a psychiatrist or being arrested for assault. I hope this helps and good luck writing! 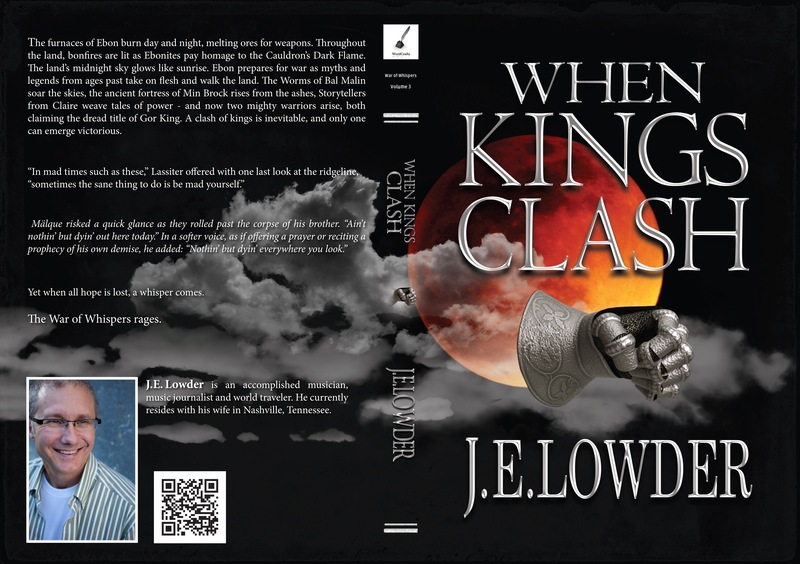 In my third book, When Kings Clash, I encountered a snag when re-writing the prologue from omniscient author to third person limited POV. How do I introduce a new primary character (the Gor King) without revealing his identity/background? The obvious answer was to tell his story through another person, but this too was a challenge. Books I & II are full of characters, so I had to make sure that a new voice was not only warranted but captivating. In my noodling, I decided to take a people group I’d used previously, the Wurmlins, and develop them beyond what I’d established: nomadic tribe; hunt in groups of three; excellent trackers; ruthless thieves. Next, I needed a new character. Since my audience is YA, I opted for a 13-year old boy I named, Mälque. How’d I come up with that name? I made sure I didn’t have too many other characters with the letter “M,” wanted it to be one syllable (I think short names sound strong and are easier for readers to grasp) and chose the umlaut because, well, it looked cool. Boring answer but there you have it. When I create a character, I have to visualize them first. I don’t use a character fact sheet (although I see the merit of doing this) but instead, mull over their psyche for quite some time. For me, this IS the nuts and bolts, the gumption, that drives them through the story. In other words, I’m more interested in my character’s home life than in his favorite color. In the case of Mälque, who is our example today, the fact that his mother was very superstitious had a huge impact on him. Although he denied her influence and even tried to navigate life by denouncing her beliefs, like gravity, he was unable to pull away from her power. But I’m getting ahead of myself. Around this time, I watched a spooky-good Indie film called Winter’s Bone, based upon the chilling book by Danielle Woodrell. In his novel, Woodrell captured the Ozark language and family dysfunction and made his characters jump off the page. What if Mälque and the Wurmlins were similar? An image of Mälque popped into my mind…long, greasy, disheveled hair (perhaps in a mullet!) soot covered face, hardened personality (to avoid getting hurt again), a survivor instinct whose weakness, that only the reader sees, is that he’s very vulnerable. In regards to dialect, the rule of thumb is to infer it. For example, if your character is a Cajun, then you inform your readers he talks with this accent and let their imaginations do the rest. I tossed this rule out the window. Why? The other rule of thumb per fantasy, and I would argue trumps (not Donald Trump!) the dialect rule is that you NEVER break the fantasy spell. So for me to let the readers know that Mälque talks with an Ozark accent would jettison them from the fantasy world. Besides, I was having way too much fun writing this way! Next, I decided to give Mälque a key phrase, one he utters to reflect his cynical heart as well as to bolster his courage:”Ain’t nothin’ but dyin’ around here.” And like a chef using a strong spice, I used it sparingly so as to not overpower the story. As I wrote and crafted Mälque, I became excited. My gut told me I was on to something; Mälque was taking on a life of his own. If you’ve ever experienced that as a writer, you know exactly what I mean. It’s WONDERFUL! But would my readers like him? The first test was my publisher, a former Green Beret, who is not one to shy away from brutal honesty. He too loved Mälque and felt he was a great addition. Although When Kings Clash has only been out a short time, the initial response for Mälque has been a big thumbs up. I hope that doesn’t sound arrogant, but as a writer, it’s a great feeling to have your gut instinct confirmed. I also received praises for another new character, Phinnton, as well as the Worms of Bal-Malin. But that’s for another time! Are You Crazy or Just An Author? So your book is published. Great! And now you’re trying to promote it. Welcome to Fight Club! But what works? I found one company that claims a book trailer is the key to success, never mind the fact that they produce videos for a living. And then there are the gurus offering free videos. I watched several but found the info commonplace and felt like I was stuck at an Amway convention. Sure enough, at the end of the freebie, they get to the point of their spiel: sign up for their not-so-free courses for the REAL secrets to success. Maybe it’ll work. Maybe I’m a fool for not buying. I guess I’m a cynical tightwad who’s not willing to toss in $500 +/_ to find out. Frustrated, I asked two friends, D.Alan Lewis & Teal Haviland, what their experience has been marketing books. Their candor was refreshing and if nothing else, confirms I’m not going crazy. Not yet. Have Paid Promotions Increased Sales? Mälque, while awaiting more loot to clean, scanned the surrounding woods. “So you’re certain that crazy man and his gors won’t come back to eat us,” he asked, his voice cracking ever so slightly as his imagination conjured gors devouring people…alive. As a Wurmlin, he had been trained to the traits of every animal in the woods. Gors were scavengers who feared men and prowled in small packs. That description changed three summers ago when men from their tribe witnessed a village being mauled by the beasts. A baldheaded man mounted atop a massive bull led the slaughter. His assembled gors – a mystery unto itself – were an army of ravaging predators. Jaws snapped arms or legs clean off while paws swatted bodies this way and that with ease. When Mälque asked what had caused the shift in the gors’ disposition, the Wurmlins hushed him with a swat to the head, or wagged their heads and mumbled to themselves. But he knew the answer. His mother had forewarned about such sightings the summer before. Mälque pulled away from his gaze and took in the ash, the blood, the severed limbs, the mangled bodies. “But this…this is…” He once more became overwhelmed by the sights and smells, and could feel his stomach rumbling. He covered his mouth and nose with his sleeved arm. His last words pressed down hard on Vonn and Mälque as they recounted the day their father died, followed soon after by their mother’s demise. From that day forth, per Wurmlin custom, they lived with Olke since he was their only living relative, even if he was a distant cousin. And unfortunately for them, Olke held to the custom that the boys were property – not adopted sons. Wild dogs lived better lives. Too flustered and perturbed to continue the lecture, he waved them off with his dagger and returned to his task. As he knelt over the body, he mumbled to himself about yung-ers not appreciating the sacrifice of kin. An odd sound made all three freeze in place. Training took over and they snapped their heads toward the woods. Without a word, Olke rose and the boys took up positions on either side, daggers drawn, ready to kill or be killed. Olke caught the scent of burnt wood. It was faint, barely noticeable, and most people – whether Allsbruthian or even Ebonite – would have missed such a clue. But he was a Wurmlin, a nomadic thief who read the woods, the winds and the streams for the slightest of signs and clues leading to their victims’ whereabouts. Like wolves, Wurmlins could follow a scent for days. Energized that he was closing in on their target – the village of Tellendale – he increased his pace. When the trees thinned, he hid behind a fat hickory tree and surveyed what lay ahead. Beyond a grove of saplings sat Tellendale, or what was left of it. Mounds of white and gray ash sat where cottages, shanties and barns had been. Littering the ground were dead bodies that he assumed were the villagers. Aside from a large bird pecking a corpse, the village was void of life. Without taking his eyes off the grisly scene, he cupped his hands together, brought them to his mouth and blew through the opening. He fluttered several fingers to create an owl-like sound. In a flash, the boys were by his side. With a final glance about the clearing, and a sniff of the wind to make sure that whoever destroyed Tellendale was gone, Olke rose and strutted out into the clearing. Long, dark hair swayed in time to his bold stride, and when a strand fell across his face, he whipped his head to set it free. Broad, determined steps brought him to the closest body where he knelt with dagger in hand and prepared to go to work. He glanced back at the brothers who were lollygagging toward the bodies. Olke snarled his lips and squinted at them. Mälque reached him first. As instructed from previous undertakings, he assumed his position near the body. Disgusted by the mutilated flesh, the tunic stained black with blood and death’s sick scent permeating the air, he turned away. “I hate this work. Too much dyin’ everywhere,” he blurted over his shoulder. “I wanna do honest Wurmlin work, like stealin’ or robbin’ or cheatin’.” Bile rose into his throat. It was all he could do not to throw up. Mälque glared at Olke. He hated the word. Although it was what Wurmlins used to describe boys of his age, Olke used it like a cuss word. Vonn knew the only answer that would spare him from being whacked again was to do his job. With tongue poking out of the side of his mouth, he slid his fingers into the blood-soaked garment. “Well,” Olke asked, impatient with his progress. Olke was about to punch him when the boy yanked his hand free and held up the prize for all to see. A collective gasp rose from all three. Clutched between Vonn’s bloody fingers was a coin, stained with crimson. “There you are,” Olke sang to the coin, his voice sultry and smooth, as if addressing a lover. “Come to me.” He stretched his hand toward the money. Vonn dropped it into his palm. “A golden giln,” Olke gushed as he held it up to the light of day between thumb and forefinger. Stained with blood, it was a shocking reminder of the manner in which they found it as well as its owner’s horrible demise. Yet all three were oblivious to such calamity and instead, gawked in awe at the coin. It promised better days ahead. Mälque, who had anticipated such an action, had already removed a cloth from his pocket. With eyes riveted on the end-over-end flight of the giln, he caught the coin in the cloth and started wiping the blood off. In no time, the gold glistened; sunlight danced across its surface. Mälque shrugged off the question and stared at the coin he twirled between his fingers. Maybe Olke was right. The giln meant hot meals and warm beds in a tavern, a far better life than chewing on rabbit gristle and sleeping in the open, using leaves as a blanket. Olke held out his palm. Mälque smirked, and for a brief moment, thought about pocketing the giln and dashing off for the woods. After all, thievery was in his blood, even if it meant robbing another Wurmlin. But when he felt the prick of a dagger through his tunic, and caught Olke’s evil expression, he thought better of his idea. With a heavy sigh and a parting glance at the giln, he surrendered the coin. He pocketed the coin and led them to the next corpse. They dropped the banter and went back to work robbing the dead.